Oregon's Department of Geology & Mineral Industries MLRR Program recognizes outstanding aggregate mining reclamation in several categories. This State agency is continually seeking nominations to recognize the positive aspects of the mining industry. All nominations received prior to February 1st of each year are considered for the previous calendar year's award. 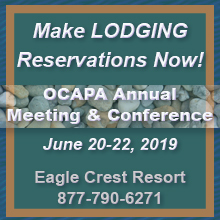 The awards are presented during the DOGAMI luncheon at the OCAPA Annual Meeting & Conference. Operators may nominate themselves, or may be nominated by others. Click here for more details, questions, or to make a nomination. This article is reprinted with permission from Stone, Sand & Gravel REVIEW magazine, ©2017, and is available from the National Stone, Sand & Gravel Association at http://review.nssga.org/JulyAugust2017/index.php#/18. This article is reprinted with permission from Stone, Sand & Gravel REVIEW magazine, ©2017, and is available from the National Stone, Sand & Gravel Association at http://review.nssga.org/MarchApril2017//#/38.